Last year, we got some ducks for the pond after a couple years without any (bad winters and predator issues), but they didn’t make it. I didn’t do a good job acclimating them to their new house and the pond. It was a difficult loss. This year, I decided to put things right. 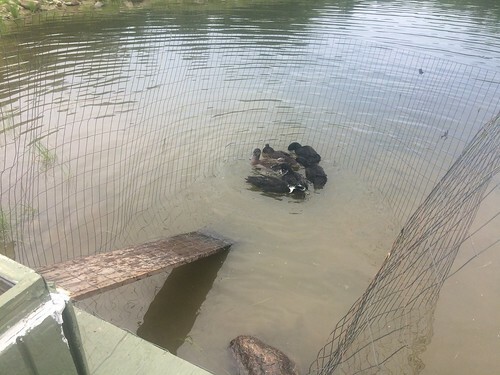 I got some ducklings and raised them in an enclosure. 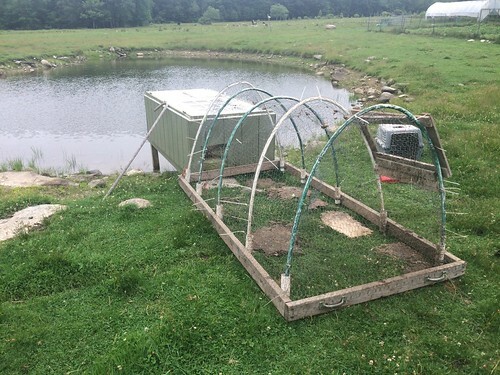 When the time came to put them on the pond, I made an another enclosure off the back of their house so they really couldn’t go anywhere. At the very start, the front (by the pond) was closed, so they only had the house and the run. Once they’d figured out that they could go back and forth into their house, which took a couple weeks, I opened up the front side with a ramp down to the water. 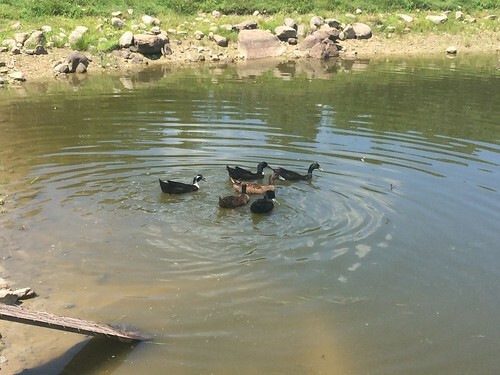 Last time, I didn’t contain the ducks well and teach them where their new home was, so this time I was very cautious. I made a fenced area in the pond. They could get down to the water and back up to the house using a ramp. 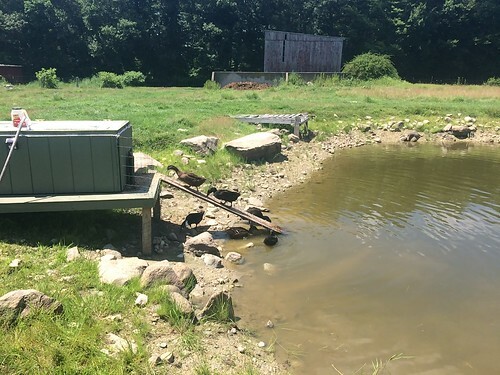 After another couple weeks, I removed the fence from the water, and the ducks were on the pond and knew where their home was. They were so happy and we were happy to have ducks back on the pond after a couple years without. Note: the water is pretty low here. When the pond is full, the water will go to just under the house and the ramp will mostly be submerged. Also, last night we had a gentle rain come through. 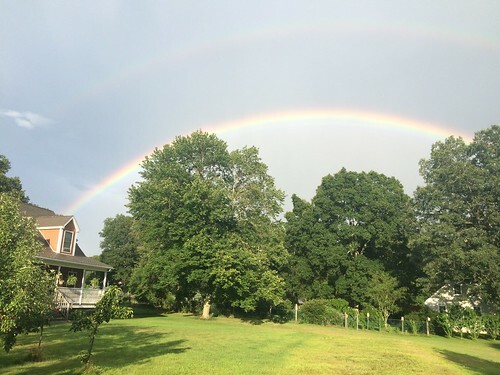 It created the brightest, most gorgeous double rainbow we’d ever seen. It hovered over the orchard and was so beautiful. What did you use for the fencing in the pond? I have ducklings that are big enough to move out to my pond but I’m wanting to be cautious as well. Hi Brittany. It’s just some standard welded wire fencing — not anything special — just what I had on hand. 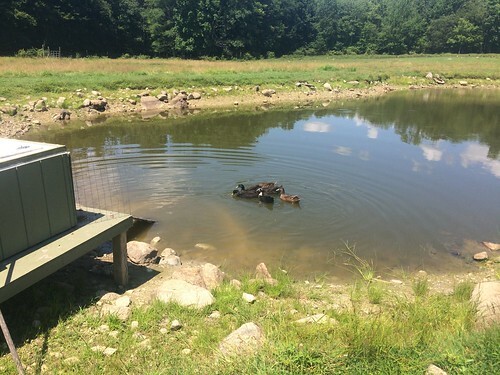 A “pond run” makes a lot of sense when you’re teaching the ducks where their home is and to protect the little ones from predators.